Nothing says summertime like ice cream! 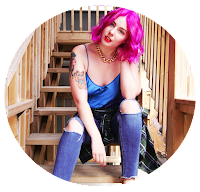 When you live in a big city like Ottawa, there are a ton of different spots to pickup the synonymous summer snack. Lucky for us, there are some innovative shops in town that are serving things up a little differently! So if you're tired of traditional swirl cones, or spooning scoops out of store-bought tubs, start taking notes! 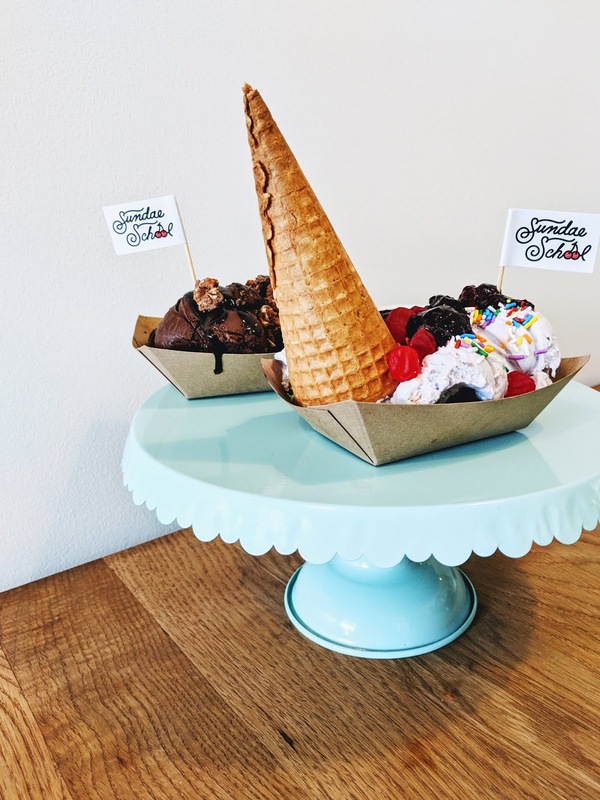 I've got the scoop on 3 local ice cream shops that you've gotta visit before summer ends! 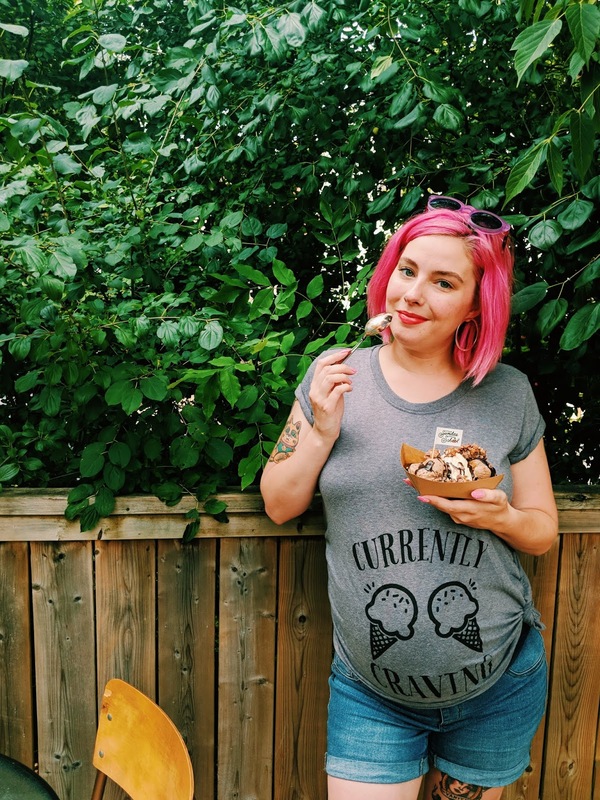 The shirt doesn't lie - ice cream happens to be my biggest craving throughout this pregnancy. These recommendations are as authentic as they come! Calico Chocolate (marbled triple chocolate) and Hong Kong Milk Tea gettin' cozy in a warm bubble waffle. This little ice cream shop in The Glebe always pushes the envelope with their fearless flavour pairings. 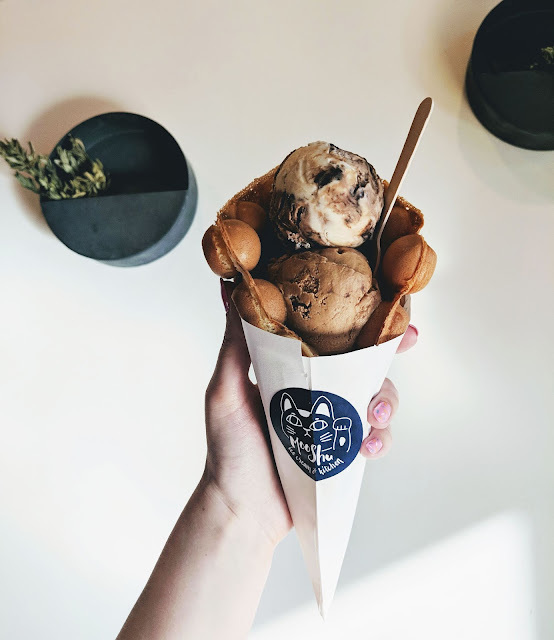 Moo Shu features a variety of hand-made, small batch ice creams infused with local ingredients, that are always equal parts adventurous and delicious. Often inspired by traditional Asian flavours like Hong Kong Milk Tea and Black Sesame, they have also offered wild creations like Peppercorn & Plum, Fire Up The Grill (charred tomato and olive oil caramel), and #NotMyCheeto (apple pie with Cheeto dust) in the past. They've even drafted up beer-infused collaborations with Ottawa's own Dominion City Brewing Co.! I highly recommend visiting them on Wednesdays, as they offer the classic Hong Kong bubble waffle to serve up your scoops in. Made fresh with local Beking eggs, they are perfectly fluffy yet crispy. The limited edition nature of their menu items always draws a crowd, so I highly suggest you run & not walk when paying Moo Shu a visit! Midwestern-style frozen custard in a red velvet waffle cone gives this classic treat a modern spin. Perhaps you've spotted this iconic teal truck around the city. The Merry Dairy has opened up a perfectly colour-coordinated shop in the heart of Hintonburg! 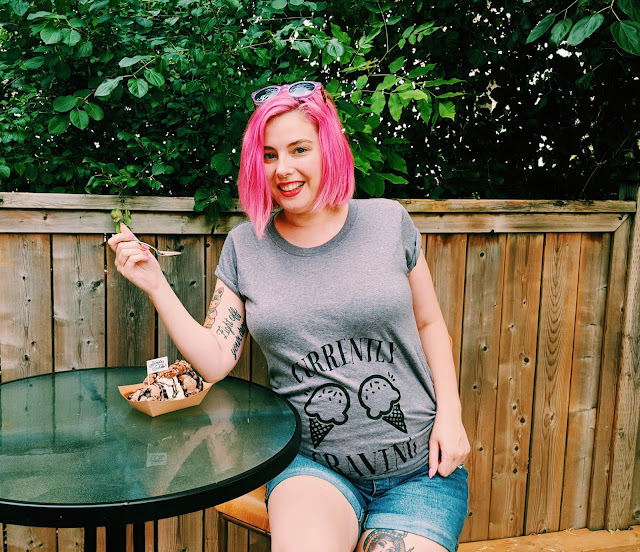 Reminiscent of the ol' corner store from back in the day, they offer a variety of traditional ice cream flavours that you grew up loving. While they serve up classic hand-scooped ice cream and soft serve, they specialize in something you may not have experienced; frozen custard! You can order it two ways: Jersey-style (soft serve), or Midwestern-style (scoop). However you like it, the addition of eggs makes for a rich, creamy, and extra-delicious frozen treat. You can even enhance the flavour of your scoop by pairing it with one of their specialty waffle cones. Imported from Brooklyn's The Konery, they offer Red Velvet, Birthday Cake, & Salted Blue Corn. They might be the prettiest cones I've ever seen, so get your Instagram ready for these babies! Can't make it to the shop? You can also 'Track The Truck' to find them at events happening around town! The Teacher's Pet & Class Clown - seems an unlikely duo but believe me, they get along just fine in my belly. Sundae School gets an A+ from me, given my love of puns and ice cream. This scholastic-themed shop is perfectly tied together with the retro schoolhouse furniture inside, and the cleverly named sundae specials. It's hard not to smile when ordering Recess Pieces (topped with peanut butter candies, hot fudge and peanut butter sauce), or the Class Clown (which features a sprinkling of candy and a waffle cone 'dunce cap'). You'll definitely feel like a kid again when you visit (kids will love it here, too!). Even if you're not crazy about toppings on your treat, you'll find the 'Free Play' offerings quite tasty. 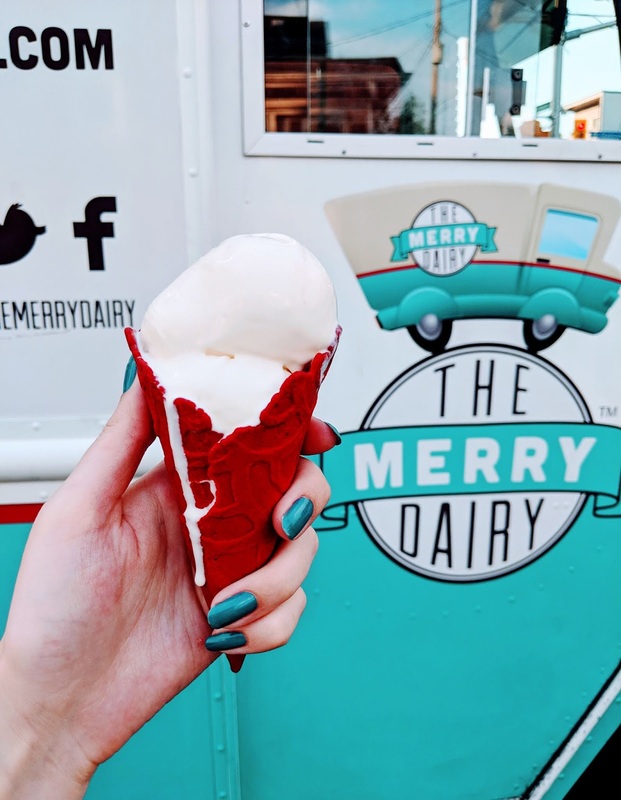 The freezer is stocked with a selection of Carp Custom Creamery flavours like classic chocolate, double-vanilla coconut, and Nerds (my personal fave). I promise after one visit, you'll be back for 'extra credit' in no time! What are your favourite Ice Cream spots in Ottawa? Leave comment below and fill me in on the 'scoop'!